Khan Resources Inc. (CSE:KRI) (“Khan” or “the Company”) announced today that it has filed its financial statements and management’s discussion and analysis for the three months ended December 31, 2015 on SEDAR and has posted these documents to its website www.khanresources.com. 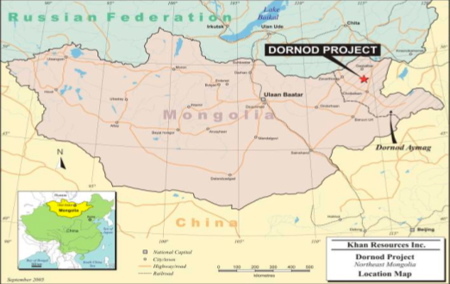 International arbitration award – On March 2, 2015 the international arbitration tribunal rendered an award to Khan as compensation for the Government of Mongolia’s illegal actions in relation to the cancellation of Khan’s uranium licenses in 2009. As of the date of the approval of this MD&A, February 11, 2016, the award aggregates to approximately $106 million (US) with interest currently accruing at a rate of 2.78% or $7,256 per day (US). In Canadian dollars at February 10, the value of the total award was $148 million. On June 12, 2015 the Company filed a petition for confirmation of its international arbitration award in the US District Court in the District of Columbia. Mongolia responded to the petition by filing on September 4, 2015 a motion to dismiss or stay the Company’s petition. These were followed by memoranda by the Company and by Mongolia on September 29 and October 13 respectively in support of the corresponding arguments. In addition, Mongolia has requested a verbal hearing of the arguments. The Judge on the case has not yet made a ruling on the motion to dismiss or the request for a verbal hearing. Dependant upon the judge’s initial ruling, the Company’s petition to certify will then be addressed. When certification is confirmed, the award will be executable in the US as a court judgement and the Company can begin a process of seizure of non-immune Mongolian sovereign assets in the US. On July 9, 2015, the Government of Mongolia filed a notice in the French Court of Appeal in Paris for annulment of the international arbitration award. The Government of Mongolia filed their arguments in support of the annulment on December 9, 2015. The Company’s counsel is currently preparing arguments for the filing of the defense, due April 9, 2016 at the latest. Meetings were held in December, 2015 and January, 2016 with representatives of the Government of Mongolia to discuss the outstanding obligations of the Government. Those discussions have now been suspended at the request of the Government and no further meetings have been scheduled. Cash -The Company’s outflow of cash in the first quarter of 2016 was $289,000 greater than the first quarter of 2015 due to legal expenses associated with US confirmation of the international arbitration award, defense in the French Court of Appeal and other initiatives in respect of the collection of the arbitration award. Cash and cash equivalents stand at $1,114,000 as at December 31, 2015. Investments – The Company did not dispose of any of its holdings in Plateau Uranium Inc. (“Plateau”) during the quarter. The fair value of the Company’s investment in Plateau increased by $37,000 to $353,523 at December 31, 2015. The following table summarizes financial results of the Company for the first fiscal quarters ended December 31, 2015 and 2014.